Reactive Systems: (as antithesis to classical AI): no explicit representation of knowledge, simple reactive code exhibits complex seemingly intelligent behaviour. Rational Agents: Proactive software systems with agenda of their own. Antithesis to classical AI: Obtain complex, apparently goal directed and intentional behaviour in a system which has no long term internal state and no internal communication. Study complete integrated intelligent autonomous agents. Agents embodied as mobile robots in unmodified worlds. Agents should be situated, e.g. operate equally well when visitors walk through their workspace. Timescales are commensurate with those used by humans. Computation is organised as an asynchronous network of active computational elements (augmented finite state machines). Messages sent over connections have no implicit semantics - they are small numbers (typically 8 or 16 bits). Meaning dependent on the dynamics designed into both the sender and receiver. Sensors and actuators are connected to this network, usually through asynchronous two-sided buffers. The system is reactive, but not purely reactive (may have state). Any search space must be quite bounded in size. There is no separation of data and computation (both distributed over the same network). There is no central model of the world. There is no central locus of control. There is no separation into perceptual, central, and actuation systems. Behavioural competence improves by adding more specific network to the existing one. There is no hierarchical arrangement. 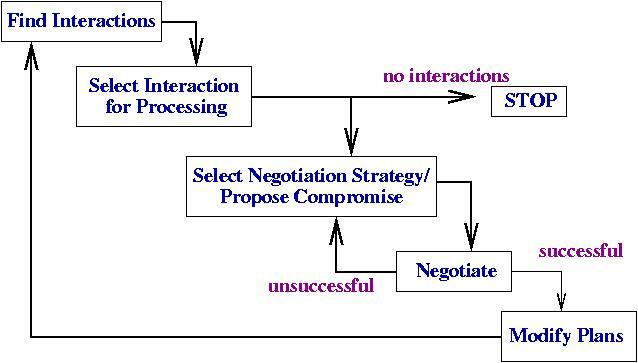 The layers, or behaviours, all run in parallel (conflict resolution may be necessary). The world is often a good communication medium for processes within a single robot. Task: wander around looking for soda cans and bring them to the starting point. sensors in the arm to reliably pick up cans. no state longer than three seconds. no internal communication between behaviour generating modules. Actuators driven by an arbitration network (fixed arbitration). Laser-based soda can object finder drove the robot so that its arm was lined up in front of the soda can, but didn't tell the arm controller to pick. The arm monitors the motion. No body motion ==> motion of the arm so that soda can between fingers. Independently, grasp reflex that operated whenever something broke an infrared beam between the fingers. By this kind of encoding it is possible that a human hands a soda can to the robot. Try to model onto-genesis (individual development) by phylo-genesis (development of the species), i.e. the development of intelligence rather than the end product. It is possible to model low level animals like ants that way. Emergence: How to predict global behaviour of set of robots? 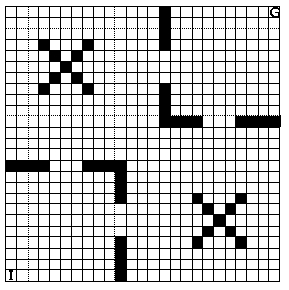 Synthesis: Given a task, how to automatically derive a program for a set of robots? Communication: Which amount of communication? Cooperation & Interference: How to coordinate? Density dependence: How many robots? Learning: What & how to learn? Assume situated agent: system consists of a planner and a reactor. When the reactor is told to act, it executes the currently available plan and then falls back on a reactive program. If complete plan: reactor executes plan. If no plan: reactor follows a programmer-provided reactive program (e.g. minimise Manhattan distance). If a prefix plan available: the plan takes the reactor part of the way, the reactive program takes over at the plan's end. If the reactor executes a prefix plan before that plan is known to lead to a solution, how can we be sure that this will not impair the reactor's performance? Solved by rfs , monotonically increase goal satisfaction probability of the reactor, no matter how much time is spent searching. Planner releases prefix plans computed in the time available. A trajectory is a sequence of operator applications, each trajectory models one possible behaviour of the reactor. A prefix plan for a problem is a trajectory in which the first actions are specified by a prefix. All states in the policy-defined subtree must be expanded before all other states in the search space. After selecting a level in the search tree by any means, a policy state in that level must be randomly chosen for expansion. In any given policy state, policy-recommended operators must be randomly chosen for application. That is, the planner knows the policy and explores the search space searching in the policy first. Then: Performance of rfs is monotonically increasing. Task: phase A - start at I go to G, grasp something, and phase B - go back to I. Policy: in phase A and B reduce Manhattan distance between current position and G and I respectively. Note: non-deterministic behaviour, in particular the reactor might be trapped. Calculate probability that the policy will lead the agent into a dead-end. The procedure accepts an initial and goal location and return the probability that the agent will become trapped in a dead-end via the execution of the policy. Minimise probability to be trapped by prefix plan. 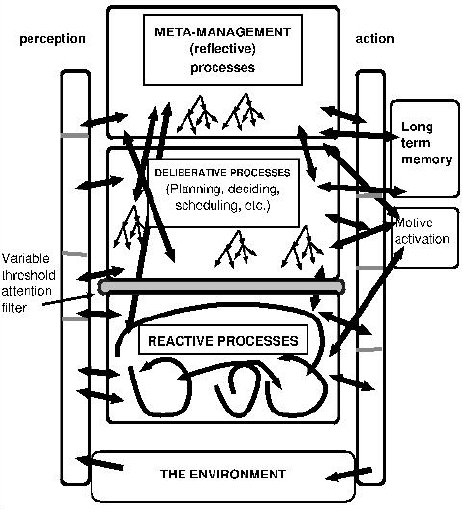 Biological systems suggest that reactivity and deliberation play a significant role. In particular in humans both aspects are important (the first for short term goals and fast reaction, the latter for long term goals and slow reaction). Hence a more complicated architecture is necessary. A system that perceives and acts [Russell-Norvig]. A proactive system with its own goals and intentions. Depending on the level of sophistication an agent should have, we need different architectures. We will look at the architecture of a learning agent, a more sophisticated single-agent architecture, and a multi-agent scenario. Russell-Norvig: An Agent is anything that perceives its environment through sensors and acts upon that environment through effectors. The learning element is responsible for making improvements. It takes knowledge about the performance element & some feedback, determines how to modify performance element. 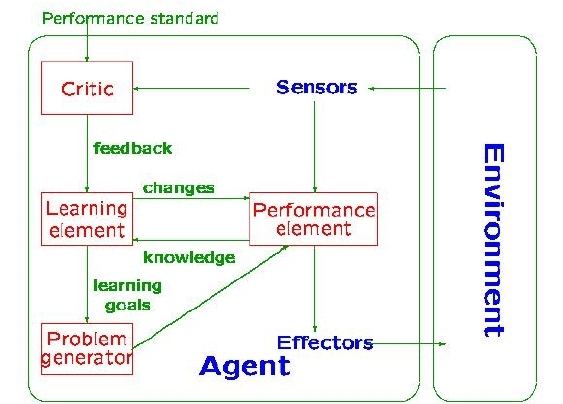 The performance element takes in percepts and decides on external actions. The critic tells learning element how well the agent is doing (and has itself a fixed standard of performance). The problem generator suggests actions that will lead to new & informative experience. "Autonomy: Agents should be able to do most of their tasks without any direct assistance from an outside source." "Social Ability: Agents should be able to interact with, when they deem appropriate, other software agents and humans." "Responsiveness: Agents should respond in a timely fashion to perceived changes in the environment, including changes in the physical world, other agents, or the Internet." "Proactiveness: Agents should be able to exhibit goal-directed behaviour." Assume a set of agents, which make plans. and a centralised coordinator which negotiates with agents about how to coordinate their distributed plans. Example: Assume a transportation task of delivering 10,000 flowers from New Jersey to New York City. The task may be performed by several trucks or by a single helicopter, a lift-truck is necessary in both cases. A coalition of trucks and lift-trucks will probably be cheaper than a coalition of a helicopter and lift-trucks. It is possible to automatically allocate the tasks by the formation of coalitions. A coalition is a group of agents that have decided to cooperate in order to achieve a common task. Calculate coalition values, i.e. determine the values of the possible coalitions in order to choose the preferred ones. In an iterated greedy process the agents decide upon the preferred coalitions and form them. The benefits of the cooperation may be disbursed among the agents (by fair methods). Communication is reduced to agents in the coalition. They reduce the network load: Distributive systems often rely on communication involving multiple interactions. Mobile agents allow users to package conversation and dispatch it to a place with local communication. They overcome network latency: They can better meet real time requirements. They encapsulate protocols: They allow for easy upgrades (no legacy problem). They execute asynchronously and autonomously. They adapt dynamically: They can sense their environment and react. They are naturally heterogeneous: They provide optimal conditions for seamless system integration. They are robust and fault-tolerant: Mobile agents' ability to react dynamically to unfavourable situations and events makes it easier to build robust and fault-tolerant distributed systems. Agent-based systems play an increasing role in e-commerce, computer games, and other fields. Agents form a framework for flexible, robust, proactive computing. Agents are realised using a wide variety of tools. There is a lot of material on-line, e.g. P. Maes, R. Guttman, and A. Moukas. "Agents that Buy and Sell: Transforming Commerce as We Know It." Communications of the ACM 42, 3 (Mar. 1999). The URL of this page is http://www.cs.bham.ac.uk/~mmk/Teaching/AI/Teaching/AI/l10.html.